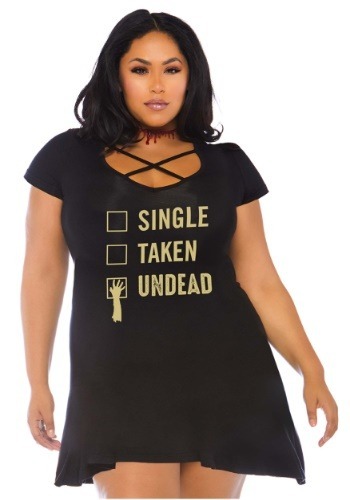 Dating as the undead can be tricky. People just don't get where you're coming from a lot of the time. You think you're being straightforward but people simply can't seem to take your statements literally. For instance, when your app asked you what you were looking for in a partner you simply put down "brains" and when you went for your date's head at the end of the first date they were all confused. When you asked if you were moving to fast, your date stated that he thought you meant you wanted a smart significant other not a tender and delicious snack. Don't get discouraged though, dating is a learning process for the living as well. Maybe change your profile to be more specific. Consider writing "I want to eat brains" or putting "internal organs" under interests. Sure, your dating pool might be a little more restricted but in our opinion, love is really only a bite away! This t-shirt dress is ready to be worn in the days leading up to Halloween to transition to the main event with the right makeup! You'll love the casual yet fitted cut and the criss-cross neckline with the hilarious undead checkbox motif on the front. About time we learned to flaunt our undead status! Whether you're dressing up for a zombie pub crawl or brunch with a few worse for wear friends after a Halloween bash, you're sure to love how easy it is to throw on this costume! Just rise from your coffin, throw this on, and go!